The production level was high and used some nice sound effects and ambient noise to help portray a vivid environment. The voices for many of the actors were irritating. One of the main characters sounded more like a spoiled brat than a space marine. At only 72 minutes long the story was far too short and there wasn’t enough time to develop the characters. I found myself not caring about what happened to any of them. The arrogant self righteousness between characters was irritating. This has long been a peeve of mine with 40k fiction. I was hesitant to write a review for this at all because I was very unimpressed with it, but maybe someone who is considering buying or listening to it will read this and save their time and money. Unless you are a completest, avoid. On a more general note, in regards to 40k fiction, one of my biggest dislikes is the tired repetition of the obvious, something that plagues the Heart of Rage. 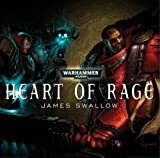 I understand that a book or audio drama (as Heart of Rage is marketed) has to be somewhat self supporting and supply a new reader with enough information to understand the subject matter… especially in a universe as complex as that of W40k. That said, the reader should not be presumed to be mentally incompetent and doesn’t need to be reminded every 15 minutes. Further to that, the mechanisms used to do this in 40k fiction are often annoyingly illogical. I’ll never understand why genetically modified super humans who train for decades before serving in elite units of dedicated brethren need to be reminded who they are and what they fight for. A narrative that simply explains it without a bunch of ridiculous dialogue would be much nicer in my opinion.